Frozen Tree at Belle Isle Detroit, Michigan It turns out that not only has my good friend ShinsanBC gotten me interested in going to Antelope Canyon to shoot, but I'm also unintentionally following him around. He posted shots of this a month or two ago and it turned out that my friends took me here (to Belle Isle) while I was back in Michigan for a recruiting trip! My friends and I arrived at Belle Isle around noon and we were lucky because it happened to be a special day when the Belle Isle Aquarium was opened (it's been shutdown due to lack of funding). I took a bunch of photos in the Aquarium that I'll post soon. As we drove into Belle Isle you could see this off to the left and I got all excited! When we finally got here it was freezing but luckily I had a hat/gloves with me. I walked around this numerous times trying to get the best angle and I've got a couple photos that I really like but I thought this shot was the neatest. The Belle Isle Ice Tree has been an annual attraction since at least the 60's. 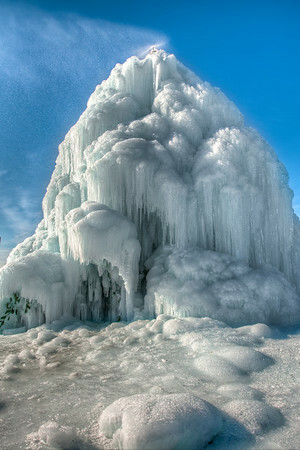 Blogger Chris Rabior found some information showing that this ice-tree was being created all the way back into the 70's. From what I've been able to determine the Detroit Fire Department sets this up each year. Apparently oversized evergreen trees are used to form the core of the annual 'ice tree' at Belle Isle.